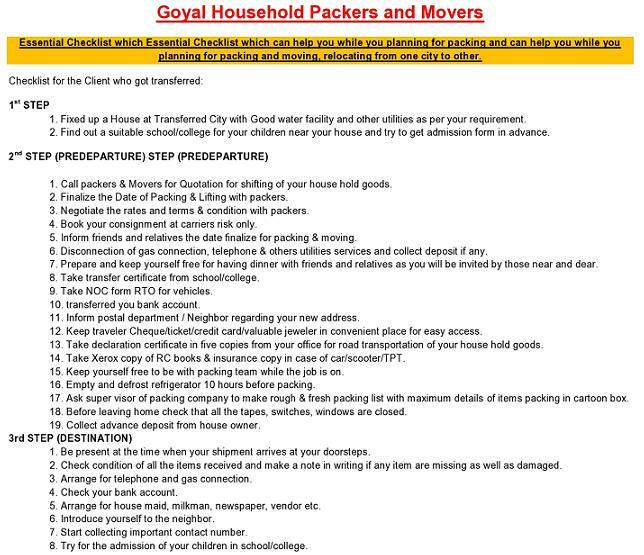 Download Packers and Movers Checklist in Image File Format. Download To Whomsoever It May Concern Format in Word File. Please prepared by following points before and after shifting. Documents required prior to packing and loading. - Copy of your transfer/joining letter authorizing us to transport. - Valuation of your household effects (item wise break-up) and vehicles if applicable. - Photocopies of R.C.book and insurance cover note for the vehicles. - Kindly prepare 3 Certificates (Proof Encl.) for the transit. Please ensure following items to be segregated and set aside by you before we start our packing to avoid any unnecessary problems to you and to your family.